At first, you can’t believe your eyes, but as they say, seeing is believing. Nevertheless, it is so surreal to see a bridge under water. Situated on the far southwestern fringes of the Allegheny National Forest and Surrounds, this is something you don’t come across every day in these Pennsylvania Wilds — or anywhere else for that matter. In all its aging glory, the Nebraska Bridge spanning Forest County’s Tionesta Creek is under water for several weeks of the year. There are days when all you can see are Nebraska Bridge’s huge overhead trusses just ever-so-slightly poking above the surface of Tionesta Creek – and there are days when you can’t even tell there’s a bridge there at all. That’s when Facebook explodes with images of the bridge’s submersion. Actually, the bridge can be submerged any time of year, but springtime is the most dramatic and prevalent. However, it was well-submerged on September 11 of this year due to heavy rains. On a “normal” day, the bridge deck sits only a foot-and-a-half above the creek waters and it doesn’t take a whole lot of water to make it impassable. 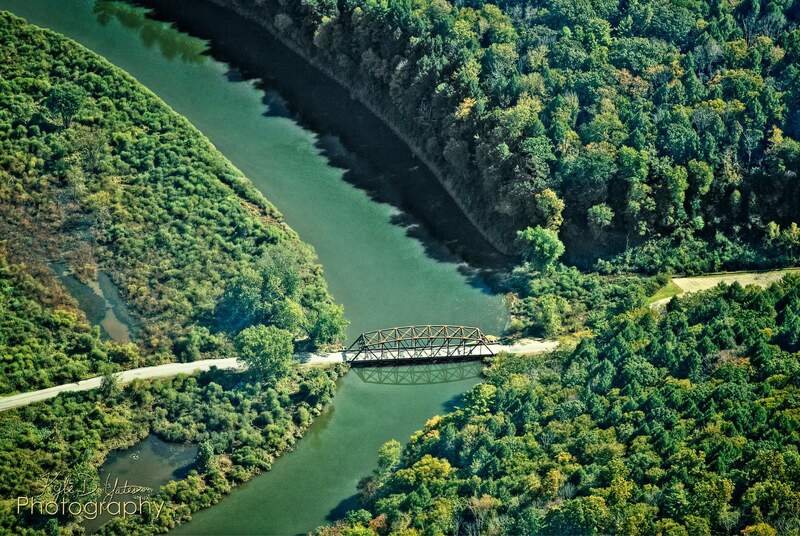 Erected in 1933, the bridge provided clear passage through the Nebraska valley and across Tionesta Creek until the U.S. Army Corps of Engineers built the Tionesta Dam, four miles downstream in 1940, to help protect against heavy flooding at the Allegheny River. Because the creek level is the result of back-flooding from the dam, rather than from rapid overflowing creek banks, Nebraska Bridge submerges, yet remains largely unscathed. The 85-year-old structure is a fitting testament to old-school bridge engineering, considering the constant flooding it has endured over the years, often making the 187-foot-long rusty hulk impassable for days and weeks at a time. For starters, there are a lot of camps and seasonal residents in the Nebraska Bridge valley, generations of families with fond memories. It is also said that there are a few dearly departed who have their ashes scattered there. The bridge deck has served as the stage for marriage proposals and prom pictures. 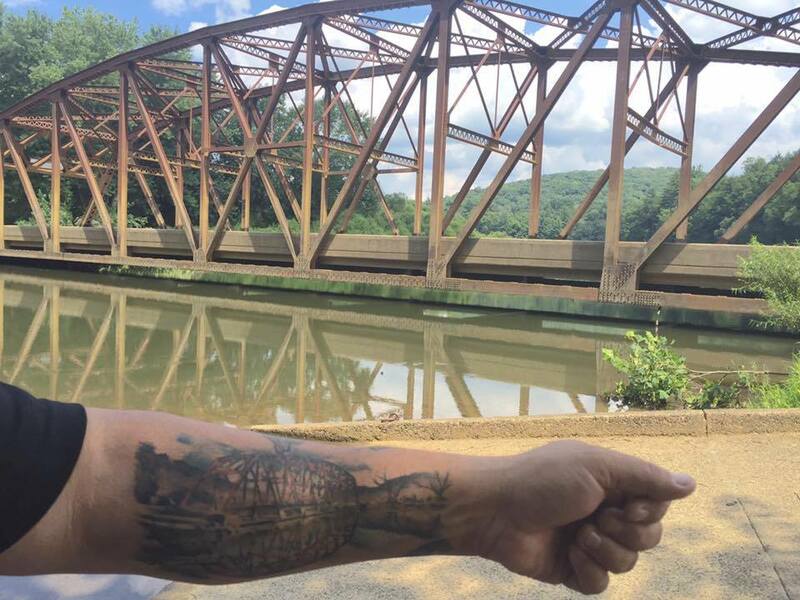 There is even a guy out in New Mexico with the bridge’s image tattooed across his arm. 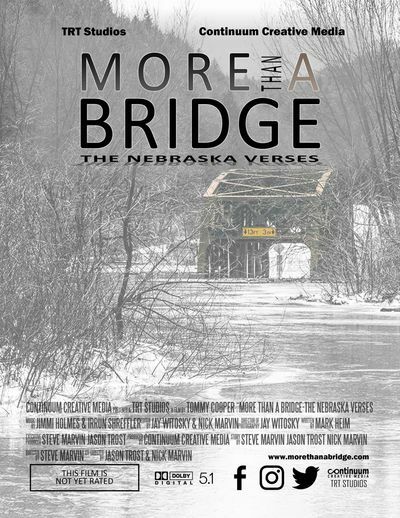 Not only does the bridge have its own 1200-member Facebook page, but in 2019, it will be the subject of a documentary film, “More Than A Bridge — The Nebraska Verses,” being created by TRT Studios and Continuum Creative Media, based in the Titusville area. But just like many of the bridge’s faithful followers, Jason said he is smitten with the serenity and beauty of the little valley. “The quality of the outdoor experience of the immediate area is a recurring theme because the valley is well-managed and relatively wild, and the water is usually welcoming, slow and deep, home to a healthy fish population,” he said. 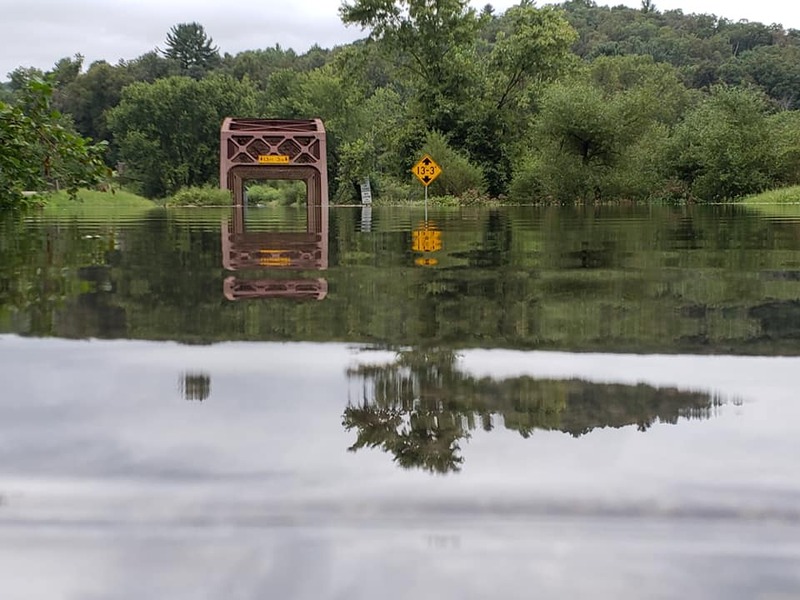 Much like the emergence of the Pennsylvania Wilds’ famous “Punxsutawney Phil,” the state of the oft-flooded “little bridge that could” generates great anticipation, with posts from scores of out-of-town followers asking; “Is the bridge still closed? Is the bridge open yet?” And, so it is. The curiosity of Facebook followers across the United States continues all year long. Jason, who co-administers the Nebraska Bridge Facebook page, admits the most intriguing thing about the Nebraska Bridge’s followers is the large number of them who have never actually been to the bridge. As the swollen Tionesta Creek’s flood waters recede, the bridge reopens to the delight of the Nebraska Bridge faithful, locals and campers alike, who flock to the valley with canoes, kayaks, motorboats, rods and reels, to celebrate and rejoice the bridge’s underwater survival. This little valley also holds a lot of Forest County history. 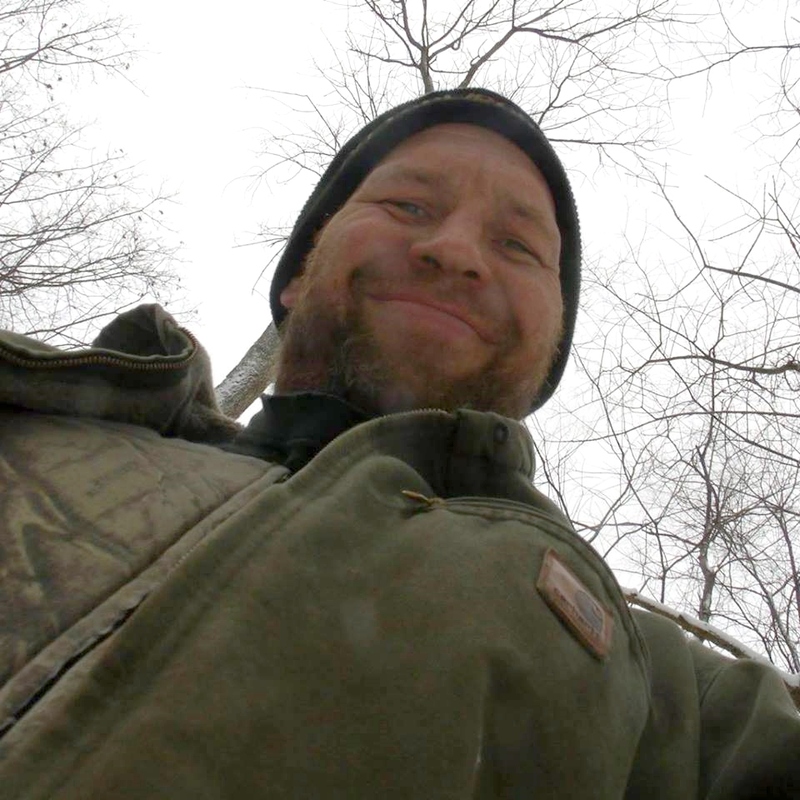 Jason hopes his documentary will attract attention to the rich lumber and oil heritage of the region and become a tourism draw. “Since embarking on this project, I have become enamored with the history of the Nebraska lumber town,” said Jason. “Of special interest to me is the story of T.D. Collins and the growth of his lumber company, from riding log rafts down to the Allegheny, to becoming in 1993 the first commercial timber company in the USA to be certified by the Forest Stewardship Council.” He adds that the Collins Company is still the predominant owner of forestland in the Tionesta watershed and was a leader in developing the current standards of Sustainable Yield Forestry. Filming the documentary began this summer and will continue through late spring as the crew tries to capture the total four-season beauty of the Nebraska valley. “The majority of the filming will be wrapped up over the next couple of months, during which time we should have all of the interviews, a planned scene reenactment, and most of the bridge and valley shots,” said Jason. The documentary project’s biggest challenge to date, according to Jason, is the painful editing and paring-down of an overwhelming amount of material, information, and anecdotes about the bridge. “We’ve been pleasantly flooded with information and well-wishes,” Jason said. Nice job. Tionesta Dam is of course downstream from the bridge. I’m from Rhode Island, been here about ten years now (retired) and love that old bridge, drive over all the time (live on German Hill Rd.) I go real slow in summer, lots of people fishing off it and it warms my heart to see the kids, our older people and the Amish come down on weekends to fish and picnic. When I first came to the area an old fellow drove me down and said to me, “there’s a bridge there,” and I said, “no way.” (LOL) Came down a couple weeks later and, I’ll be darn, there it was–it’s just so cool. Got scared once, state talked about doing away with it–if that ever happens, it would be a great loss. Can’t wait to see the documentary, been going to the bridge for over 50 years. Have seen every stage no bridge, 1/2 bridge all bridge! Just amazing that after 85 years still good as new. Love Nebraska bridge. So many childhood memories and recent fishing excursions with my granddaughter! They should have left the bridge at it’s original location. Further upstream and slightly higher than this bridge. Although it would have still flooded. Wow, how exciting! I have so many memories of this bridge. My brother casting his fishing line and the hook getting stuck in my head. Didn’t realize all the history. Thanks for bringing it to the fore front.